This Summerset Sizzler Grill conversion “How To” is brought to you by John Cerul of BBQ Concepts. Give us a call if you have any additional questions or would like to schedule an on-site design consultation with us. BBQ Concepts is Las Vegas, Nevada’s premiere outdoor kitchen designer & manufacturing company. Converting your Summerset Sizzler 32” professional barbecue grill is a lot simpler than you might think! With a couple of simple and widely available hand tools, this NG to LP conversion video tutorial by BBQ Concepts, and a little bit of patience, you’ll be able convert your Natural Gas Grill over to a Liquid Propane setup. Here at BBQ Concepts, we like to help our customers with their outdoor kitchen products. 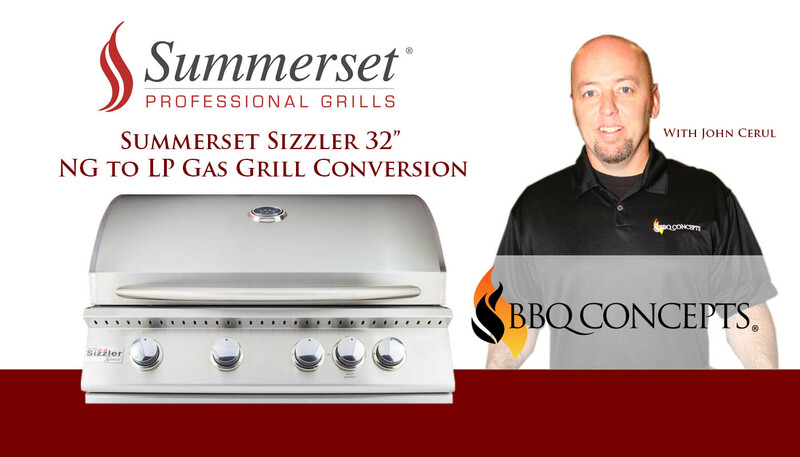 We’ve developed this “How To” video specifically for the Summerset Sizzler 32” Barbecue Grill. If you don’t have a Summerset Sizzler 32” grill, we recommend contacting your grill manufacturer and speaking with a representative about what you’ll need for your grill model. Learn how to convert your Summerset Sizzler 32” Barbecue Grill from NG (Natural Gas) to LP (Liquid Propane). In this tutorial, John Cerul of BBQ Concepts will take you through the entire process of converting your NG orifices over LP orifices. With this video, you’ll have your grill converted to use Liquid Propane in no time. Disclaimer: In no event shall BBQ Concepts be liable for any direct, indirect, punitive, incidental, special consequential damages, to property or life, whatsoever arising out of or connected with the use, misuse, or modification of this product.